Search.hnotepadpro.co is the PUP that uses misleading techniques to prevent removal. Use Reimage to locate malicious components and get rid of them faster than with uninstall instructions. A full system scan blocks virus reappearance and prevents traffic to malicious domains. Notepad Pro works as a browser hijacker, but it looks like the advanced version of Windows Notepad. The application is promoted on suspicious websites and spreads in freeware bundles. 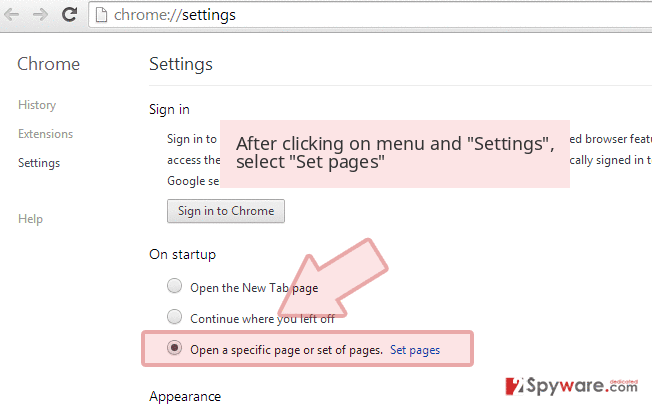 Once it gets into the system, it modifies browsers’ settings and sets startup page to Search.hnotepadpro.co. Notepad Pro virus infects web browsers ( Internet Explorer, Google Chrome, Mozilla Firefox) and assigns search.hnotepadpro.co as new tab URL and default search engine, homepage. The problem is that hijacker reassigns these options over and over again if a user tries to set his or her preferred startup page or built-in search engine. 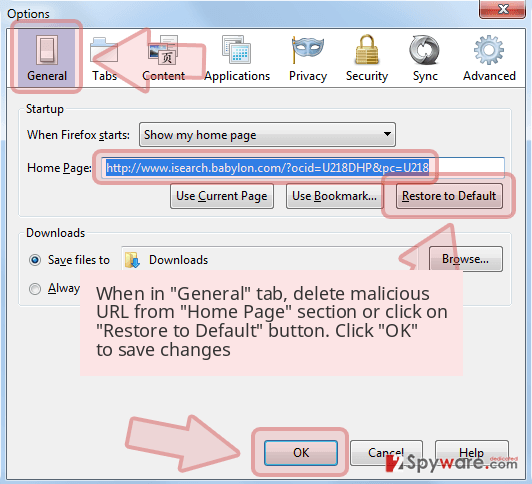 Search.hnotepadpro.co virus is created in a way that users are unable to revert their default browser’s settings back. Therefore, this potentially unwanted program (PUP) does everything to remain on the computer as long as possible. As a result of these changes to the browser, the whole performance of the device becomes sluggish. Constant appearing increased number of sponsored advertisements affects experience online as well. However, the biggest issue here is Search.hnotepadpro.co redirect problems. 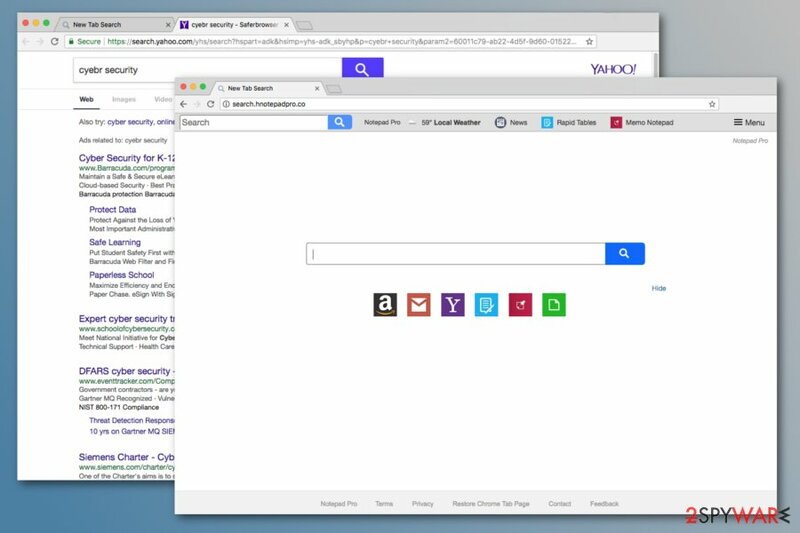 The browser hijacker might redirect to third-party websites that are potentially dangerous. For instance, some sites might promote bogus software; others suggest great shopping deals and trick into revealing personal details. Therefore, trusting the content provided by Search.hnotepadpro.co is not recommended. The primary purpose of the search engine is delivery of relevant search results and helping people to find needed information. Despite the fact it redirects to Yahoo results page, the hijacker might redirect to other sites once you click on the desired link. This makes getting normal and needed results an impossible task. Browsing-related problems are the main reason why you should remove Search.hnotepadpro.co. However, the research team from Viruset.no also points out another negative aspect – data tracking capabilities. As we have mentioned before, commercial content displayed by the PUP is considered as potentially dangerous. Therefore, Search.hnotepadpro.co removal helps to avoid possible dangers and protects your information from being used for advertising purposes. It is possible to remove Notepad Pro manually. However, we suggest relying on Reimage or another anti-malware program. It’s the easier way to get rid of all suspicious components that may have been installed together with PUP or by a hijacker itself. Search.hnotepadpro.co - a suspicious search engine that negatively impacts browsing sessions. 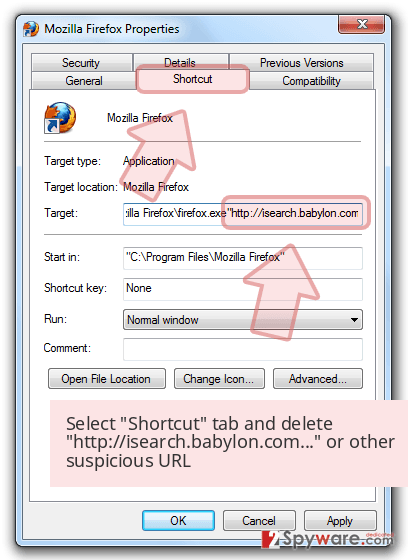 Developers of numerous browser hijackers know how to spread and where to hide them. 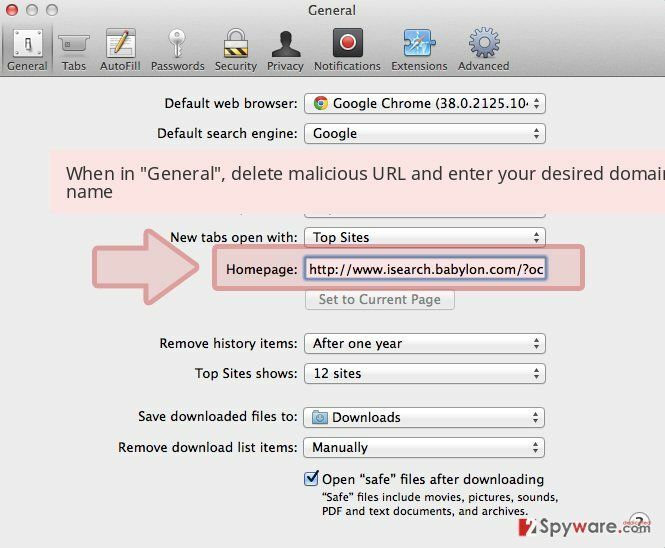 Even though, some hijacker programs have official download websites the most common way of infiltrating is installation without permission – with the help of deceptive software marketing technique called bundling. When you are downloading and installing something form high-risk websites or P2P networks, you might be unknowingly installing software package. PUPs are often attached to freeware or shareware, and if you use Default/Quick installation, you are installing the whole bundle, not only the primary program. However, you can always avoid these unwanted programs from installing. By choosing Advanced/ Custom option for installing new software the bundled of programs can unpack and you have an opportunity to de-select them and download only the software you need. Also, any advertisement that suggests updates to your software or any questionable products can be fake and infected with these hijackers. Be careful on the internet and pay extra attention when selecting any boxes during installation processes. For a proper Notepad Pro removal you need to get rid of suspicious extensions, add-ons, and other plug-ins from your browser’s settings manually. Additionally, you should look up for other programs that may have been installed on your PC too. If you are considering manual Search.hnotepadpro.co removal, you should have a look at our prepared instructions below. They will explain how to find and eliminate all components related to the browser hijacker. 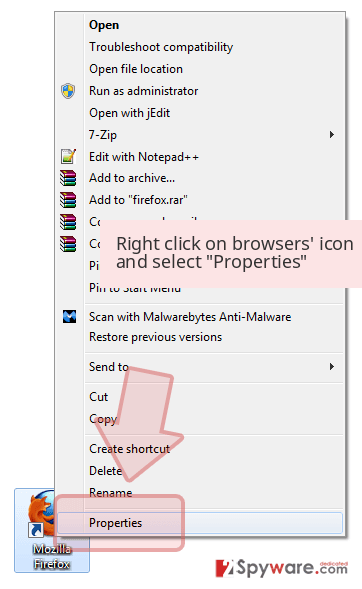 If the situation doesn’t change and your browser is still acting up, you should try to remove Search.hnotepadpro.co automatically with the help of anti-malware programs. Software should be downloaded only from official sources and using direct links, not questionable ads. Here, look for Search.hnotepadpro.co or any other recently installed suspicious programs. Wait until you see Applications folder and look for Search.hnotepadpro.co or any other suspicious programs on it. Now right click on every of such entries and select Move to Trash. When in the new window, check Delete personal settings and select Reset again to complete Search.hnotepadpro.co removal. Once these steps are finished, Search.hnotepadpro.co should be removed from your Microsoft Edge browser. Here, select Search.hnotepadpro.co and other questionable plugins. Click Remove to delete these entries. Now you will see Reset Firefox to its default state message with Reset Firefox button. Click this button for several times and complete Search.hnotepadpro.co removal. Here, select Search.hnotepadpro.co and other malicious plugins and select trash icon to delete these entries. Click Reset to confirm this action and complete Search.hnotepadpro.co removal. Here, select Extensions and look for Search.hnotepadpro.co or other suspicious entries. Click on the Uninstall button to get rid each of them. Here, look at the Homepage field. If it was altered by Search.hnotepadpro.co, remove unwanted link and enter the one that you want to use for your searches. Remember to include the "http://" before typing in the address of the page. Now you will see a detailed dialog window filled with reset options. All of those options are usually checked, but you can specify which of them you want to reset. Click the Reset button to complete Search.hnotepadpro.co removal process. ^ Microsoft Notepad. Wikipedia. The free encyclopedia. 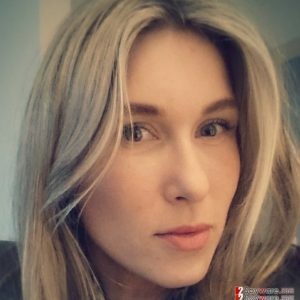 This entry was posted on 2018-05-21 at 01:18 and is filed under Stealing programs, Viruses. You can quickly scan the QR code with your mobile device and have Search.hnotepadpro.co manual removal instructions right in your pocket. How did you remove Search.hnotepadpro.co?